A customer appreciation strategy can benefit all businesses and all departments who have contact with customers/clients. Your plan doesn't have to be overly complicated or cost a lot and a happy customer can also mean less stress on employees, which makes everyone happy! So, how can we make customers happy? It takes a little more than just a great product or service because your competitor may have a great product/service too. But, if a customer knows they get unparalleled customer support or other meaningful benefits from your company, they will think of you when it's time to make their next purchase. Even better, they will also recommend your company to others! If you don't have a customer appreciation strategy then where should you begin? One of the best ways to get ideas is from your employees. Why not ask them via a simple 2 question survey? What was your best customer experience and why? How would you like our company to show appreciation to customers/clients? Get feedback. Shortly after doing business, contact the customer to find out whether they were satisfied. If they had a positive experience, find out as much as you can so you can duplicate that success or even highlight it to your staff. If it was a negative experience, find out as much as you can so you solve the problem and avoid the same situation in the future. Highlight your customer/client success stories especially if it relates to their use of your product/service. This can be done in social media, on your website or in email newsletters. Deliver valuable support content. The content can be in the form of newsletters, whitepapers, webinars, blogs or posts in social media that help your customers make the most of your product or service. It is important that the content is "valuable" to your customers and not a sales pitch asking for another purchase. For example, if your company sells a product, one of the best strategies is to tell customers other ways to use the product, or ways to use it more effectively. Offer exclusive coupons, freebies or free delivery for customers who have purchased from you before. Make sure your 'loyalty offer' is different from what you are offering to the general public. Send a Birthday Card with a coupon for a discount, free delivery or something else of value that your customer will appreciate. Send an Anniversary Card on the yearly anniversary of their first purchase/anniversary of doing business with your company. This is a perfect opportunity to keep in touch and provide something of value, like the recommendations above, even if you don't know their birthday. Provide referrals to your customers. In B2B customer relationships, it is beneficial to know what your customer does and how they do business. If you develop a solid, trusting relationship with a customer/client, when an opportunity to send business their way arises, you can feel confident in recommending them and they will appreciate the referral. Now that you have compiled your ideas, it's time to examine the competition's customer appreciation strategies – not just to emulate them but to make your program even better. You don't have to treat all your customers the same. 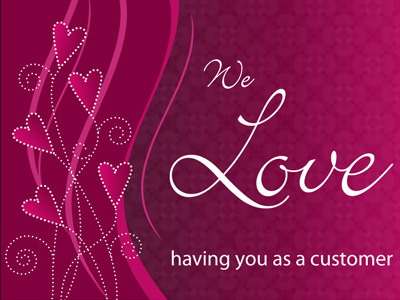 As you finalize your plan, you can choose who to include in the various customer appreciation strategies you created. For example, you may have different tiers of customers based on their purchase history or product type. Want more ideas for starting or improving your company's customer appreciation program? Check out our latest newsletter – Customer Appreciation: Easy Ways to Create Better Customer Relationships - which includes tips on how to use all of the above concepts while working with CorpNote. After Valentine's Day, the next big holiday isn't for another month. And for some of us, confidence in our New Year's resolutions and plans for 2018 might be starting to fade as we get bogged down in our never ending "to do" lists. People get behind because they procrastinate and they procrastinate because they are overwhelmed that they are so far behind! That's why our next issue tackles the topic of ways to end procrastination! Please take this brief survey to tell us about your questions/comments on the topic. And as always - we thank you for your continued support!